Home AP Scholarships AP State PMRF SCHOLARSHIPS TG State TS Scholarships PMRF 2018 Important dates, Online application form, How To Apply? PMRF 2018 Important dates, Online application form, How To Apply? PMRF Applications to start from February. 24: Check eligibility, important dates, how and where to apply. 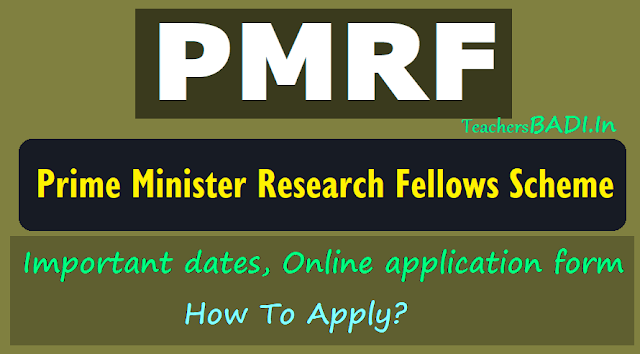 Inviting applications for the Prime Minister's Research Fellows #PMRF . You may apply online on http://pmrf.in/. Prime Minister's Research Fellowship, PMRF applications would start from February 24, 2018. Candidates interested in applying are required to apply online on the official website pmrf.in. PMRF was announced in the Union Budget 2018 speech by Finance Minister Arun Jaitley. Under the scheme, 1000 students from IITs, NITs, IISER's and centrally funded IIITs would be selected each year for Research Fellowship at any of the 23 IITs or Indian Institute of Science, IISc Bangalore. Check the eligibility, important dates, selection process, steps on how to apply as well as direct link to apply online for PMRF 2018. As per the guidelines now available, final year students of IITs, NITs, IISERs and centrally funded IIITs are eligible to apply. The students include those who are in the four-year undergraduate or five years integrated M.Tech. or integrated M.Sc. program in the said institutes. Students of these institutes who have been awarded degrees from in the past five years are also eligible to apply. Please note, students who have completed their bachelors from a different engineering college (not included in the list) but have completed their M.Tech from IIT or the listed institutes are NOT eligible to apply for the fellowship. Also, candidates are required to have scored a minimum CGPA/CPI of 8.0 on a 10.0 scale. Please note, for the students in the integrated program or the dual degree program, the CGPA or CPI of UG part (first four years) will be considered. Candidates who fulfil the eligibility criteria are required submit their details in the application form along with a project abstract of not more than 1000 words in a PDF format. The abstract should formulate a problem of study in the correct format with the name of the candidate on the top. The candidate is required to submit an original abstract in his/her own words. This abstract would be sued to assess the applicants' analytical ability as well as research skills. Once shortlisted, the candidates would then have to appear in a GATE like single entrance test for the chosen domain followed by an interview. Candidates can start from February 24, 2018. The online application portal would be opened on pmrf.in and would be available until March 31, 2018. Candidates are required to fill the form, provide Aadhaar card details and other documents as may be asked in the application form. The direct link to the website is also provided here. Candidates can go through the details, the FAQs and other important information provided on the website. Fee payment can be done online. Steps on payment of fee and how to fill the forms are also provided on the official website.